Team Fortress 2 recently got a new update. In broader strokes, it’s pretty standard stuff: new contracts, new weapons, new maps, coordinated aerobics, etc. Players, however, have uncovered some small details that impact the game in a big way. To mitigate some of the aforementioned sticker shock, Valve’s also introduced a weapon loaner program, which allows you to borrow specific weapons for the duration of contracts that involve them. You can’t trade or craft loaned weapons, but they’re free and work exactly as advertised. The most quietly impactful part of Tough Break, however, is a slew of balance changes that have players alternatively elated and worried. Nearly every class has picked up new/better ways to acquire health, and weapons badly in need of nerfs—for instance, the crit-happy Half-Zatoichi—got them. Players are, however, divided on some fairly significant changes to the Pyro. A popular Pyro weapon called the The Degreaser got nerfed bigtime, which some think will encourage more variety in Pyro builds. Others, however, feel like Pyro players have been backed into a corner. Meanwhile another Pyro weapon that some consider to be less skill-oriented, the Phlogistinator, got buffed with a brief taunt invincibility period. So, regardless of your opinions on what all of this means, Pyro is definitely Different now. Also controversial are changes to the Engineer and Demoman. The Engineer got nerfed in a handful of small ways—especially when faced with a Spy’s Sapper, which now renders the Engineer’s sentry gun inoperable for even longer. Some see it as needless overkill, given that the Engie’s already suffered in recent times. The Demoman, meanwhile, received tons of changes that primarily focus on making the Demoknight (that is, a melee-focused Demoman) less effective. Many felt like the Demoknight was overpowered, but others are now unsure of the build’s viability against classes like Pyro. Players are also reporting significantly decreased framerates in the wake of the new update. However, there appears to be a pretty easy fix for that: just go into your Steam settings and opt out of the beta program. Apparently that’ll get things back to where they’re supposed to be. For now, anyway. As for things not in this update, you’ve probably noticed that competitive matchmaking is still nowhere to be found. Players did, however, uncover a “ranked background” hidden in the files of a small update to Tough Break. 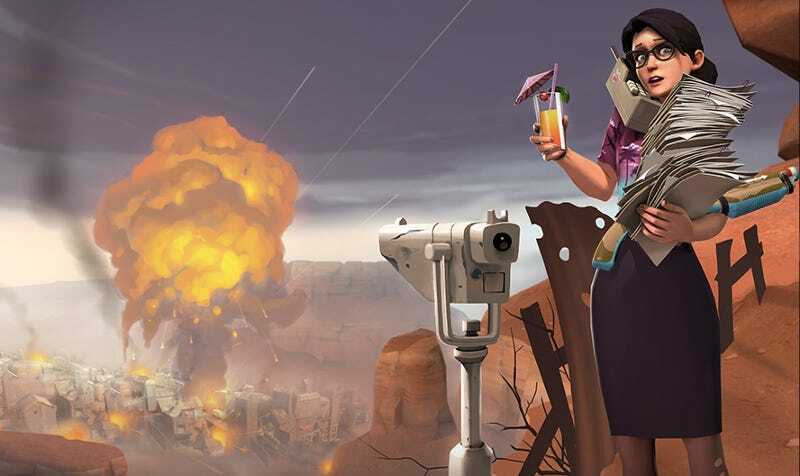 Valve has said that official competitive TF2 servers are finally on the way, and there’s ample evidence to suggest that it’s happening soon-ish. Consider this more fuel for that fire, more hats for the bottomless hat dungeon. So that’s the new update in a nutshell. Have you uncovered any big changes that didn’t immediately stand out? Which ones do you think will have the biggest long-term impact on Team Fortress 2?